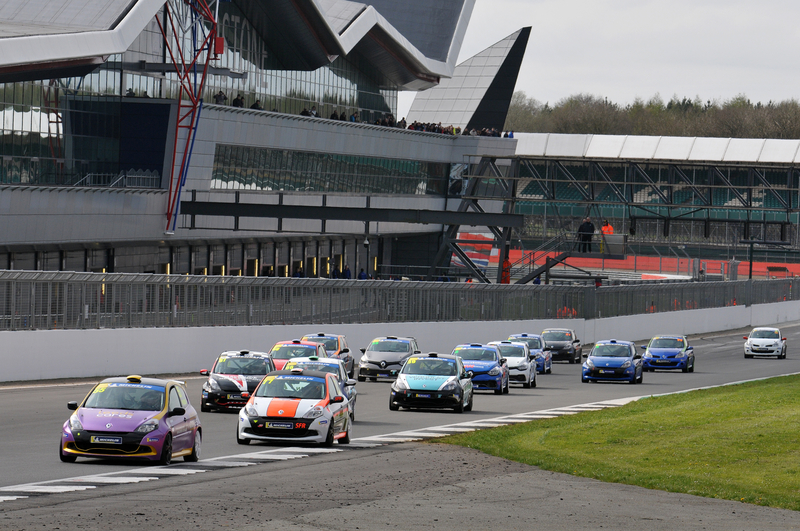 Luke Pinder edged out Simon Freeman after a race-long fight to win an action-packed Michelin Clio Cup Series season opener at Silverstone International. Pinder – who already smashed the qualifying lap record en route to a double pole position on Saturday – made a strong start and, together with Freeman, pulled out a four-second gap to the rest of the Race Series field behind. The duo were barely inseparable lap-on-lap, before a small mistake on the exit of Becketts on the final lap handed Freeman an opportunity and they ran side-by-side down Hangar Straight. Freeman briefly led into Stowe before getting slightly crossed up, allowing Pinder to get a run on the outside and retain the inside line for the last chicane at Club, and he duly took the chequered flag 0.118 seconds clear to start Jade Developments’ campaign in style. The battle for the final spot on the podium proved equally thrilling between compatriots and team-mates Ronan Pearson and Paul Bell. It was Pearson who held the early advantage from the get-go, but with Bell breathing down his neck the 17-year old had few opportunities to relax in the opening exchanges. The position switched hands just after half-distance as they went either side of Darren Geeraerts at Club, with Pearson running slightly wide on the outside at the corner’s exit. That handed Bell a chance to seize third, but Pearson recovered well and re-took the place at the same corner two laps later. They would remain nose-to-bumper for the rest of the contest and were split by just 0.228s at the flag. A steady season-opener for Tony Verhulst saw the Belgian ace take fifth for Westbourne Motorsport, with James Joannou sixth on his debut in the Race Series. In the Sport Series, James Colburn made history as the only man to win in each of the Michelin Clio Cup Series’ three different classes. His fourth-generation RS Clio 220 in the team’s traditional blue-and-white livery made the best start, whilst behind MRM’s Tyler Lidsey managed to get the jump on Italian racer Ambrogio Perfetti. Their battle was arguably among the closest on track, with less than 5 seconds covering that trio across the 16-lap race distance, but there were to be no changes and Colburn starts the campaign on top. Patrick Kibble was fourth after a late swap before qualifying into the Sport Series, with Richard Guy and Harriet Guy rounding out the top six. Nic Harrison’s dominance of the Road Series continued after an imperious lights-to-flag win, extending the CGH Imports.com with Jade Developments’ winning-streak to 16 races. His title defence could scarcely have started in better fashion, with a lighting getaway soon translating into a 17-second lead. Darren Geeraerts took his best-ever finish in the category in second as he continues his development curve with the race-converted Renaultsport Clio 2000, whilst Richard Colburn was a non-classified finisher after mechanical maladies forced him into pit lane in the early stages. The second and final race of the weekend at the 1.85-mile International circuit – the ‘Home of British Motorsport’ – gets underway at 15:50 BST. Luke Pinder said, “Considering our lack of testing, it’s great to be back in the championship and winning the opening round of the season. Full credit to Simon, he pushed me hard for that victory, it was a superb race between the two of us at the front. “Everybody at Jade Developments has worked really hard to get the car into this position and I’d just like to say a big ‘thank you’ to them, my family and everybody else who’s enabled me to get to this point. James Colburn said, “I’m really happy to become the first driver to win in all three classes, that’s something to be proud of. It was an interesting race in terms of judging our pace compared to the Race Series guys – it must have been exciting for spectators to watch as we passed and then were re-passed by some of them. Nic Harrison said, “It’s fantastic to start the season on a high, of course, and to extend my winning streak in the Road Series to 16 races. Everybody at Jade Developments worked well and the car was in good shape.